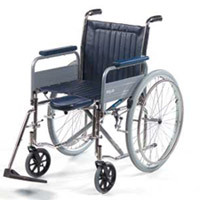 There are a wide variety of wheelchairs available from a diverse set of manufacturers that are working to create chairs and lifts in a wide array of options to accommodate just about any disability out there. Large corporations, small specialized producers, and innovative new companies round out the type of manufacturers in existence today. Choosing the right wheelchair for you can be a difficult decision but if you do your homework and stay focused on your particular needs you should be able to weed through the sea of chairs and find the one that will fit your lifestyle. This is Not an all inclusive list but will get you started. Just click on any of the logo’s below to find out more about that company. This list of wheelchair manufacturers is not any type of order. If your planning on using Medicare to help with the costs be sure to read our article on How to get a Motorized Wheelchair through Medicare.